Winter can be a tough time for anyone. The cold weather can make getting out of the house and seeing your friends (or going for a jog) deeply unappealing. The short days and absence of sunlight can cause depression (such as SAD) or negatively impact your mood in other ways. For seniors, the effects can be especially pronounced, which is why it’s so important for seniors to stay socially active all winter long. Depression among older adults can often be mitigated or reduced through an active social life. Planning or facilitating meaningful social activities is an essential part of senior care, and it’s an aspect of senior care we take to heart at All Seniors Care Living Centres. One of the first things you will learn about our senior housing options is that we love an active, motivating calendar. Our retirement communities always have something going on, whether it’s classic movie night, chair yoga, Bocce, or arts and crafts. 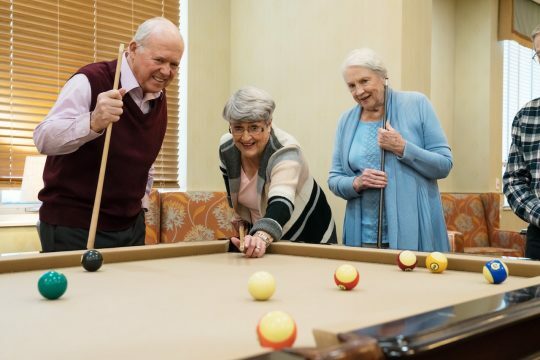 Retirement communities are all about making new friends, finding new hobbies, and rekindling old passions. With plenty of opportunities to play games, make art, and meet new people, our retirement residences keep things fresh and interesting. Social activities should be high on the list of qualities you look for in retirement homes and living centres in Alberta or anywhere in Canada. One of the highlights of staying at an All Seniors Care Living Centre is our annual ASC Games. The Games begin in February, but Spirit Week is coming up quickly, taking place from January 14 to 18. As one of the highlights of the year, Spirit Week gets everyone excited for the ASC Games, which include competitions in Wii Bowling, Archery, Billiards, Bocce (always one of the most hotly contested competitions) and the French version called Pétanque, as well as Wii Golf, Shuffleboard, and card and board games. One of the reasons the ASC Games takes place in February is because the heart of winter can feel like a lonely, isolating time of year. The lack of sunlight can cause depression, tiredness, and anxiety. The ASC Games are designed to promote physical activity throughout the winter, as well as the many social activities available at All Seniors Care Living Centres. There are plenty of opportunities for residents to practice their Bocce game or their become experts at their favourite card game. It all reaches a fever pitch for the ASC Games. To find out more about how we promote social activities through the ASC Games and through our regular activity calendar, call us anytime to learn more about them. Opportunities to socialize and activate both body and mind are essential for getting through the winter. That’s not just true for seniors, but for everyone. A great retirement community is one that brings people out of their winter hibernation and gets them moving, laughing, and enjoying life to the fullest.